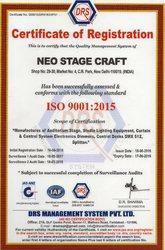 "Neo Stage Craft", came into being in the year 2000 and proved its competency as the known manufacturer and service provider of the wide range of led par lights, moving head lights, projection screens, profile spot light, lighting desk console, stage frills. Our products are manufactured by using the material of premium quality and in confirmation with the specific quality norms. We make our range available at reasonable prices, keeping the budgetary constraints of clients in mind. "mr. Vipin kumar (proprietor)", has played a vital role in our success. Our well-equipped and state-of-the-art infrastructure has enabled us to carry our business operations in smooth and efficient manner. We have updated our unit with advanced machines, which in return have helped us to carry bulk production with great ease. These departments are looked after by the experienced and skilled staff having years of industrial experience and knowledge. Efficient segregation has enabled us to ensure smooth and systematic completion of organizational tasks. Quality is primarily focused by us and assurance is given by us that the clients are served with nothing less than the best. Quality experts are specially hired by us, who take care of each stage ranging from the procurement of raw material till the final dispatch. We are known to be the quality-oriented firm and ensure that the products comprising the prescribed norms are offered. Our experts make use of quality material in manufacturing the quality of products. We have hired the panel of experts so that the best range is delivered to the clients. We test the products on varied parameters. We are supported by the experienced staff having excellent industrial knowledge and experience. Our team comprises quality analyst, R&D experts, warehouse personnel, management staff and sales and marketing staff. These professionals are trained on regular basis, so that they can cope up with the ever-changing business trends. We aim at sincerely rendering immense satisfaction to the clients by serving their demands in an efficient manner. Our long term presence in industry has helped us to serve the industry. Products are offered at reasonable rates and manufactured as per the prescribed quality norms. We ensure that the customized solutions are provided to the clients. We lay down great emphasis over the quality of our range and ensure that our clients are served in an appropriate manner. Customization facility is offered keeping the customers ease in mind.